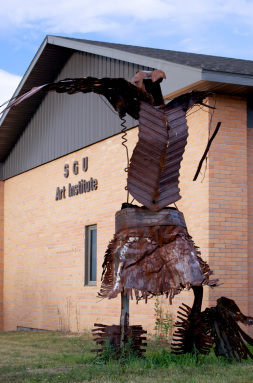 The Great Plains Art Institute at Sinte Gleska University is founded to provide serious art students with intensive study of both mainstream and Native American art. Our mission is to prepare Lakota students with a background in history, criticism, and theory, combined with the skills necessary to teach, and or produce art. The program is committed to teaching from a bicultural viewpoint, promoting the study of Lakota aesthetics, incorporating elders, teachings, and interfacing with the community. The Great Plains Art Institute at Sinte Gleska University offers two degree programs: a two year Associate of Arts degree (A.A.) and a four year Bachelor of Arts degree (B.A.). The Bachelor of Arts degree provides a foundation for graduate studies in studio art, art history, museum studies, or art therapy.